We need to fully appreciate yet another example of what the mainstream media doesn’t yet get! The “People” increasingly don’t see the system working for them anymore and have as consequence become much more willing to try something very different, possibly even extreme, depending on how serious their personal blight has become! Unorthodox politicians like Donald Trump in the US, with disruptive, non-internationalist politics are increasingly emerging globally,with a particularly large list of new European populist leaders and parties. This movement against the perceived status quo is rapidly gaining support, as we witnessed this week in the Dutch elections. Anti-Islam leader Geert Wilders’ far-right Party for Freedom (PVV) may not have won, but the high profile election advanced the anti status quo EU movement significantly. On the surface Prime Minister Mark Rutte’s People’s Party for Freedom and Democracy (VVD) may have won temporarily, but VVD supporters are highly likely to become disappointed and in the future move towards major change. This is an expected process when social inequality and system corruption begins to become obvious to the masses! While Rutte’s victory in Holland has the elites and the media proclaiming the populist revolution is dead (despite a surge in Wilders’ support relative to mainstream parties), movements driven by Euro-skepticism and “anti-establishment” sentiment remain top of mind in all of Europe’s key elections this year. On some level, as Goldman notes, the “populist” political trends in these countries are nothing new; strong populist influences have ebbed and flowed in Europe over time. But this tide has again swelled in recent years for both economic and socio-cultural reasons. While few think Euro-skeptic forces will win control of government in any of the upcoming elections, as GS Chief European Economist Huw Pill argues, even that result should be far from comforting for proponents of the European vision. In Pill’s view, mainstream European parties are caught in a trap, with needed reforms likely to draw ire from both ends of the political spectrum. 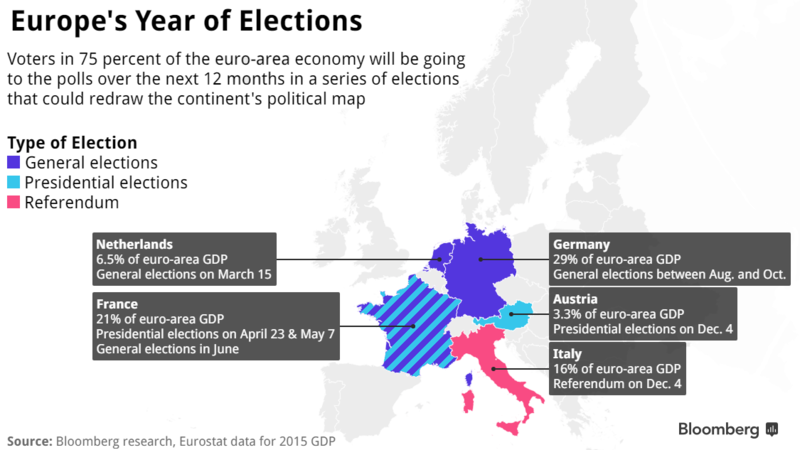 The upshot: Unless mainstream politicians use their (expected) wins this year to capitalize on the favorable macro environment and move swiftly to overcome voter concerns, Euro-skeptic threats will continue to rise and support for European integration will further erode. Freer Market Economies (jobs with real wages). This is what is coming in one form or another to Europe. History tells us that the most worrying problem should be whether the extreme left or extreme right gains the upper hand. It is basically only a matter of timing and the transition details. Particularly troubling is that scary times are ahead for those people least prepared for them and who don’t deserve to be hurt. To understand the change underway we need to view radical change as something which inevitably flows from a dysfunctional financial system. This in turn will inevitably lead to radical change in the financial system! This is how our society has evolved and will continue to evolve, lest we forget that a society is about people and their changing needs. The Internationalists can only maintain their as yet unrecognized parasitic debt slavery control for so long. This “consuming more than you produce” leads to a speculative financial environment and inevitably a crisis. When the inevitable crisis arrives, we can expect that those cloistered to plan the rebuilding from the rubble of today’s financial system will hopefully end up with some sort of reworked gold standard. This may sound crazy today but the reality is that having a ‘gold like’ standard forces the surrender of power from those who create the money. Those who control money creation control the economy and financial system, in-turn they then control the political apparatus! The supply of gold which has traditionally only been able to growth at 2%, matches population growth of approximately the same order. As a result gold holds its value. Though it will take a crisis to make happen, we are undoubtedly on the path to controlled markets. 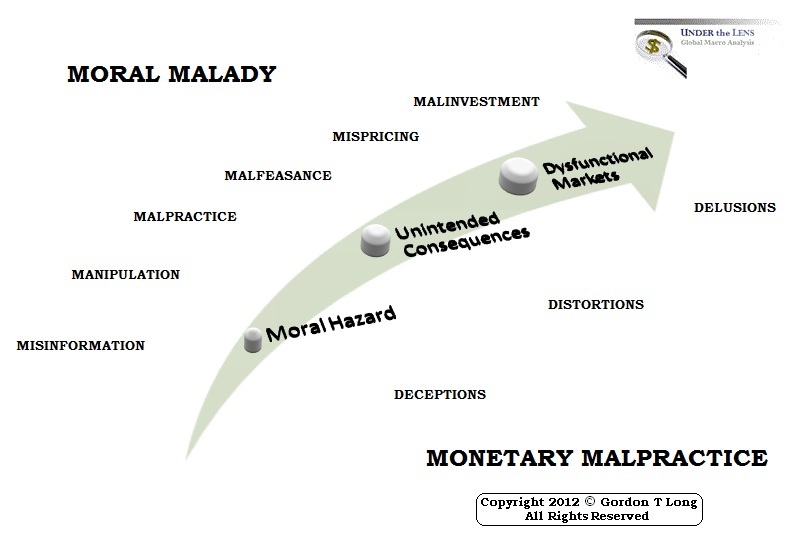 Increasing control, distortion and manipulation are signs the central bankers believe a potentially devastating financial, economic and political disaster lies ahead. Many believe the Fed is already manipulating the financial markets by directly pushing interest rates down and indirectly through proxies. They understand corporations are going to run out of borrowing power to buyback inflating stocks and pay their dividends. This will soon critically expose the markets. The real question is will they succeed or will it trigger the public realization that the central bankers and governments are manipulating markets. 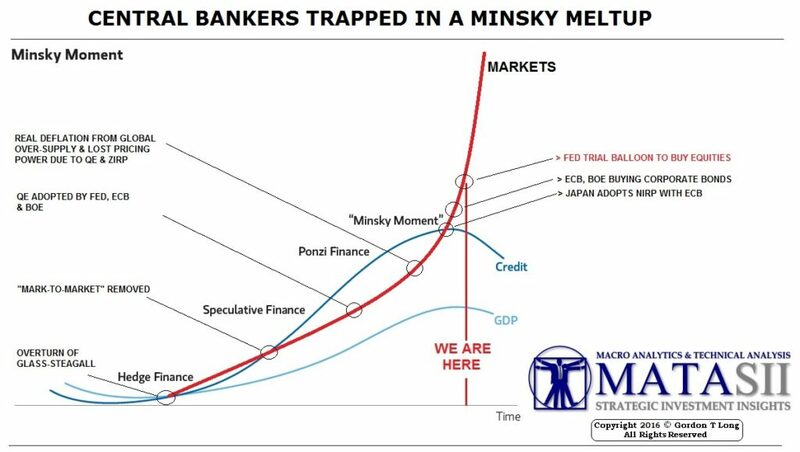 Like the 1920’s realization of German money printing igniting hyperinflation, we could see the realization trigger a Minsky Meltup in assets. Both doomed to inevitable failure. Massive fortunes to be made if you can time this right!! There is a big short opportunity out there somewhere in the not to distant future.